BRADFORD - The parents of a children (sic) left retarded after a DPT vaccination have received an award of $4.5 million. 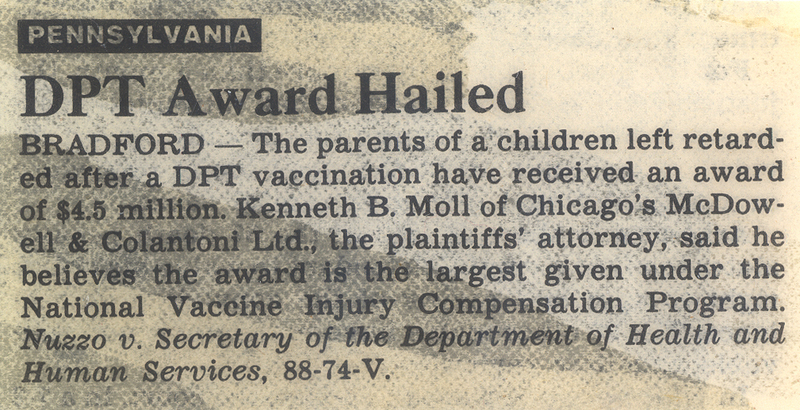 Kenneth B. Moll of Chicago's McDowell & Colantoni Ltd., the plaintiffs' attorney, said he believes the award is the largest given under the National Vaccine Injury Compensation Program. Nuzzo v. Secretary of the Department of Health and Human Services, 88-74-V.